A few decades ago, creating music was only for the big stars. You had to buy expensive equipment, pay for studio time, hire session musicians, and pay someone to mix and master the music. Back in the day, that was how to make electronic music. But thanks to new technology, you can now do it all on your home computer. In this article, we’ll discuss how to make music on a laptop without playing a single live instrument. What Do You Need To Start Making Music On Your Computer? Your computer and its operating system (OS) play a huge role in how you make music. The best software is mostly available on Windows and Mac OS X, so I’d recommend getting a computer running one of those operating systems. If you prefer, you can use Linux OS. There are distributions of Linux which concentrate on multimedia creation such as Ubuntu Studio and AVLinux. Just be prepared to spend more time getting things to work if you decide to use Linux because many of its music creation tools are not as polished as those on Mac OSX and Windows. Practically all computers come with a sound card already installed so you can work on music without a dedicated audio interface. So that leads to the obvious question: why do you even need an audio interface? If you want to record from external sources or if you just want better performance, you’ll need an audio interface. You also need an interface if you’re going to connect proper studio monitors to your setup.Interfaces come in different, shapes, sizes and with different types of ports. If you’re unsure which interface to choose, you can read this article to point you in the right direction. Is it possible to make music using consumer-grade speakers and headphones? Sure it is. BUT, it’s better to buy studio-grade monitors and headphones for monitoring your sound because they give you much better results. Studio-grade monitors/headphones are designed to have a flat response so that you can accurately hear what is going on in your music. For a more comprehensive look at studio monitors, you can read this post, which ought to help you make a decision on the set to buy. 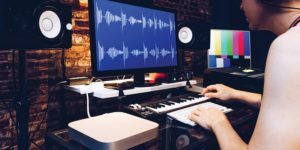 Your DAW is the heart and soul of your setup, and it determines your overall workflow when creating music. So you have to choose wisely. You can make practically any type of music on any DAW, but some handle specific tasks better than others. For instance, if you want to make electronic dance music (EDM), then your best choices are FL Studio, Logic Pro, and Ableton Live. I use FL Studio for my production and REAPER for my mixing and mastering tasks. FL Studio is one of the most popular DAWs today, thanks in large part to its ease of use with a mouse. Some DAWs only run on specific OSs. For example, Logic Pro only runs on Mac OSX, and Acid Pro only works on Windows. So this is a major thing to pay attention to. If you need to add vocals to your tracks or record things like percussion or acoustic guitar, you’ll need to get a microphone. Condenser microphones are usually preferred in the studio environment because they’re typically more sensitive and will capture a more defined sound than dynamic mics. However, dynamic mics can work just as well or even better in some situations, like when you’re recording something loud (drums, electric guitar, screaming vocalist). Each has its advantages, but the most beginner-friendly mics connect via USB because you can plug them directly into your computer and get started right away. You can find a great selection of studio mics here. A MIDI keyboard controller allows you to input notes using a traditional musical keyboard layout. Basically, it’s a little piano. I use an Alesis V25 due to its portability. It’s not necessary to own one in order to learn how to make electronic music on a computer since most DAWS will enable you to draw in notes using your mouse. Does it use USB or a traditional MIDI connector? Does it have drum pads? Does it have additional knobs and controls you can map? Is it customized for use on a specific DAW? How can you generate real sounds like pianos, guitars, and analog synthesizers without the actual live instruments and gear? Virtual instruments are the answer. Sample players: these work by playing back pre-recorded sounds (samples). Synthesizers: these generate sound using waveforms, such as sine waves, to emulate different instruments. These come in the form plugins which you can insert into your DAW to generate sound.The good thing is that most DAWs come with some built-in instruments so you can get on with production right away. Reason, Logic, Ableton and FL Studio are well known for coming with a comprehensive selection of built-in instruments. However, if you want to expand your sound library, you can find a large selection of plugins such as samplers, synthesizers and SoundFont players for purchase and for free on the internet. The next step is to collect a lot of one-shot samples and loops. You will typically use these samples for drums, special effects, percussion, and vocal licks. You can download free samples from sites like Sample Swap. You can buy samples and loops from marketplaces like Producer Loops. You can record and create your own samples. The fastest way is to download samples, paid or free, and then manipulating them. But you can createyour own samples with your own unique sound, which plays a BIG part in making your music easily identifiable. Once you have all the tools in place, you have to decide what style of music you want to create. If you choose to create electro house music, then it’s a good idea to listen to that type of music a lotso that you learn how it’s supposed to sound. What type of sounds did the producer use? Which instruments are the loudest in the mix? What kind of melodies and chord progressions were used to build the song? As you grow into a seasoned musician, you should make a habit of referencing and learning from other people’s work. Try your best to avoid copying outright, but don’t be afraid to borrow from others. Drums are the driving force in EDM. Workflows differ, but if you’re just starting out as a musician, I’d recommend that you work on your drum section first so that you get the groove of the track down. You can use premade drum loops if you don’t want to build a drum section from scratch.Depending on the song, you may want to start with a premade drum loop and then layer additional drum samples on top to beef up the beat. Bass works in the same frequency range as your kick drum, so it’s a good idea to work on these two elements side by side.The rest of the music making process becomes much easier once you get the bass and kick to play nice with each other. The melody is the most infectious part of a song. Your software instruments come in at this stage. Your melodies need to sit nicely on top of that solid rhythm section you put together. The melody can be in the form of chord progressions or single note progressions. It’s all up to you really. You can get creative with all sorts of synth sounds, pianos, and different samples to bring life to your track.Use this time to experiment with arpeggiators, strumming and play around with some dope effects to vary up the melody. I often add some layered pads to add texture and fill the empty space. Just keep in mind, not everything is meant to be a lead. It’s easy to get carried away and add too much melody to a song. Think of it this way: some sounds should be used to add harmony, others to add melody, and others to fold in texture and depth to your track. Ever wondered how producers get their tracks to gradually sound like they’re being submerged in water or played from a gramophone? Automating various parameters and effects in the song can introduce some interesting results. And the good news is thathe most popular DAWs allow you to draw out automation envelopes. Practically anything which has a knob can be automated. This includes volume, pitch, panning, EQ, and wet effects knobs. For example, you can automate the volume of a pad or lead synth to slowly increase as the song begins, so as to create a building effect. Another example is to automate a low pass (or high pass) filter on the lead synth in various parts of the track. This can help to bring out or take away the energy of the track. Basically, automation can help bring your track to life and add some variety and movement. Butou should avoid falling into the trap of automating every single element in the track. The song may end up being overproduced, which is a big no-no. How do you take your song to the next level and make it sound like the pros? Mixing. That’s the key to giving your song that professional polish. This process involves gain knobs as well as effects modules like equalizers, compressors and reverbs. Levels are the number one thing you need to watch, even before you start adding EQ and compression. EQ should only come into the picture when you need to carve out space for other sounds, you need to cut down on a weird sounding frequency, or for special effect. Virtually every DAW comes with built-in EQs, compressors, and reverbs, which are good enough to get the job done. I prefer to start by mixing my drums and bass first. I try my best to make them punchy and in your face, then I mix the other sounds around that foundation. Panning is another tool which is often overlooked. Avoid panning your kick and snare drum though. Panning these can make your mix sound unbalanced. It’s important to reference other people’s work while mixing, so don’t be afraid of taking breaks to listen to how others mix their tracks. But wait. Mixing isn’t the only step that take your song from good to professional. Ever wondered why professional songs sound louder than DIY musician songs? The reason for this difference is that the songs were mastered differently (or mastered at all). Mastering is the process where an entire song is compressed to make it made louder, punchier and more of a pro-level sound. It’s the final coat of paint which optimizes your song to ensure the best possible playback on all systems. EDM doesn’t pay too much attention to dynamics unlike other genres like jazz or classical music. Louder is generally considered better in EDM, as long as the song doesn’t distort. Your primary tools for mastering are EQ, mastering compressors, and stereo wideners. You should only be making minor EQ changes at this stage if your mix was done well.If you find yourself having to make extreme changes it may mean that you didn’t do as well as you could have mixing the song. Don’t hesitate to go back and mix your track again if this is the case. Once your song is published, you can’t un-release it, so you need to spend plenty of time perfecting it until you’re satisfied. There’s so much information available on the internet to help you grow as a musician and home recording producer. Learning how to make electronic music can be challenging at first, but it becomes easier with time and practice. Try to experiment as much as possible — of the greatest creations in the world came about by experimentation. Lastly and most importantly, enjoy the process.